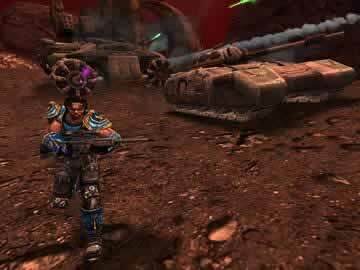 Unreal Tournament 2004: Editor's Choice Edition Game Review - Download and Play Free Version! Online play lets you test your skill against others. Large number of weapons to use. Vehicles add to the multiplayer game. Several scenario modes to play like Capture the Flag and Onslaught. Coarse language is unsuitable for younger players. The time to battle is now! Host huge multiplayer wars with tons of weapons, vehicles and diverse terrains and choose from 10 exciting game modes! In this multiplayer-focused first-person shooter, take your battles to the extreme! Devastate your enemy with intense vehicles like goliath tanks, manta hovercraft, heavy trucks and more. 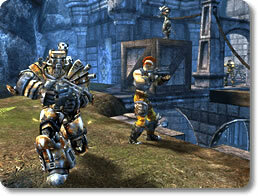 Whip out hand-held weapons like link guns, mine guns, grenade launchers and more to bring your enemy down fast. The goal is to destroy your enemy so completely that you'll earn lifetime bragging rights with your friends. Challenge yourself and your friends to 10 different game modes, including Onslaught mode that allows team battles of 10 to 32 players on expansive outdoor maps and Assault mode that requires teams to capture each other's strategically-distributed power nodes. You can find almost any type of map you could dare to fight on with more than 100 maps available featuring a wide variety of environments, from half-demolished cities to busy rebel bases, all with great graphics. If your friends aren't available for huge battles, play offline against the computer to build your skills. Regardless of how you play, this game will provide tons of excitement, fast-paced fighting and extreme destruction! When the battle begins will you be the one to finish it? Accept the challenge now in Unreal Tournament 2004: Editor's Choice Edition! Fast paced first person shooter (FPS) action is at your fingertips with Unreal Tournament 2004 (UT2004). A large amount of weapons lets you wreak havoc on your foes with unlimited creativity. A campaign combined with multiplayer, at home and online, will give you unlimited hours of FPS delight. With the adult language and large amount of gore this game is better suited for older players. UT2004 is a futuristic FPS game. A single player mode is available, but this game focuses largely on multiplayer action. The game is set in the year 2362, and various characters make up teams that are competing in the most anticipated tournament ever. 12 teams in all will be competing for the tournament trophy and bragging rights. There are several modes of gameplay available with the most in depth being multiplayer. Multiplayer has two choices: you can compete against computer opponents to hone your skill or play online against other people. Various scenarios are available for multiplayer action. You can compete in Assault where teams alternate turns defending or attacking an objective. 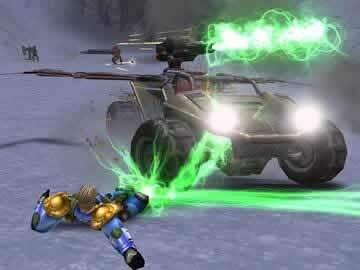 Onslaught is another option where you must capture nodes and destroy the enemies power core. Onslaught allows the use of vehicles adding to the action. Two other scenarios, Capture the Flag and Bombing Run are similar in objective (you must take an object to a point to score). In Capture the Flag, you must infiltrate the enemy base capture their flag and return it to your own base. In Bombing Run, an orb will be placed in the center of the map, you must pick it up and deliver it to the enemy base. These are only a few of the scenarios you can compete in. There are tons of weapons available for fighting. Standard rifles, Bio rifles that shoot green blobs that melt your opponents, even a lightning gun. All guns have two modes of fire extending your destructive capabilities even further. Vehicles have weapons as well. The scorpion has blades that extend out and slice enemies in half. Controlling your character is quite easy movement is accomplished with the WASD keys, and aiming and shooting is done with the mouse. The graphics in UT2004 are good for this type of game. They aren't the best ever but are similar to Halo style graphics. The soundtrack and sound effects are great for this game. The character sound bites are unsuitable for kids but very entertaining for adults, the intended game audience. It is possible to turn the gore off but online players can speak through microphones and there is no filter. Online play is very entertaining, but has a very steep learning curve. If you are unfamiliar with online FPS gaming you will need a lot of practice before you can hope to compete. This is one of the few drawbacks to UT2004. Experienced FPS gamers will be able to pick up on the tricks of the game relatively quick but others will struggle for a time. UT2004 takes multiplayer gaming to a new level. With all the scenarios available you can certainly find something to suit your style of play. A large stash of weapons and vehicles lets you destroy your opponents in any way your heart desires. Younger kids should not play this game due to the gore and adult language, but it is an excellent game for anyone else. Witness some of the action that takes place in Unreal Tournament 2004.